Manhattan, KS (July 5, 2018)—Harry's has been honored for the fourth straight year for its wine program in Wine Spectator's 2018 Restaurant Wine List Awards, which highlights restaurants around the world that offer the best wine selections. The restaurant received the Award of Excellence. Harry's is one of 3,592 restaurants from all 50 states and more than 75 countries listed by Wine Spectator. The awards have three levels—the Award of Excellence, the Best of Award of Excellence and the Grand Award—with 2,335, 1,168 and 89 winners this year in each respective category. Manhattan, Kansas - Harry's Restaurant, a longtime fixture in Manhattan's downtown business community, announced that it will begin constructing a new private dining space this August. The additional space will be created through an extensive renovation of Harry's DELI, which will permanently cease operations Aug. 18. The new private dining space is slated for an October opening. Manhattan, Kansas - Tallgrass Taphouse co-owners Tallgrass Brewing Co, Jeff Gill and Ward and Brenda Morgan announced they are turning to the restaurant management team that owns and operates Harry's, Harry's DELI, and Bourbon & Baker to assume day-to-day operations of the nationally and regionally recognized brewpub. 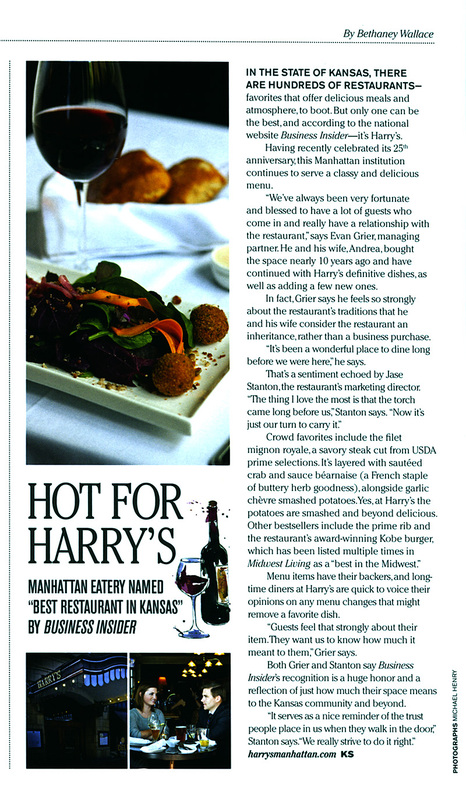 Harry's was chosen to represent Kansas in The Best Restaurant In Each State article posted at livesmarter.com. "The restaurants that have made it on the list have been ranked according to expert reviews, local recommendations and the number of James Beard award nominations. We’re going to take a look at the best restaurants in America, each from a different state." Manhattan's 313 Magazine featured Harry's in the "Home Cooking" article about cooking like the pros for the holidays in the Winter 2016 issue. Read the full article. Manhattan, KS - Two Kansas entities dedicated to excellence have united to create an exceptional dining experience for guests. Harry's and The Beef Marketing Group, Manhattan, Kansas proudly announce their partnership. As a result, Harry's now offers exceptional new entrées including filet mignon menu items and signature appetizers featuring Braveheart Black Angus Beef. Manhattan, KS (July 16, 2016) - Harry's has been honored for the second straight year for its wine program in Wine Spectator's 2016 Restaurant Wine List Awards, which highlights restaurants around the world that offer the best wine selections. The restaurant received the Award of Excellence. Harry's is one of 11 Kansas restaurants out of 3,595 restaurants from 50 states and 72 countries listed by Wine Spectator. The awards have three levels—the Award of Excellence, the Best of Award of Excellence and the Grand Award—with 2,414, 1,093, and 88 winners this year in each respective category. Harry's added one more Top 100 ranking from OpenTable. This time it is as one of the 100 Most Romantic Restaurants in America. Harry's is at the middle of Manhattan's new culinary scene in this Chicago Tribune article about food experiences in Kansas. At the center of Manhattan's wine scene is Harry's, a restaurant inside the historic Warham Hotel (now residential), with a list of 215 selections that would make most any sommelier feel at home. Read full article. In the State of Kansas, there are hundreds of restaurants – favorites that offer delicious meals and atmosphere, to boot. But only one can be the best, and according to the national website Business Insider—it's Harry's. Read full article. Manhattan, KS (July 30, 2015) – Harry's has been honored for its wine program in Wine Spectator's 2015 Restaurant Wine List Awards. The restaurant received the Award of Excellence, which recognizes a wine list offering an interesting and diverse selection of wines that are well-presented and thematically match the restaurant's cuisine in price and style. The restaurant is recognized among other winners from all over the globe as a top destination for wine lovers. Read full press release.